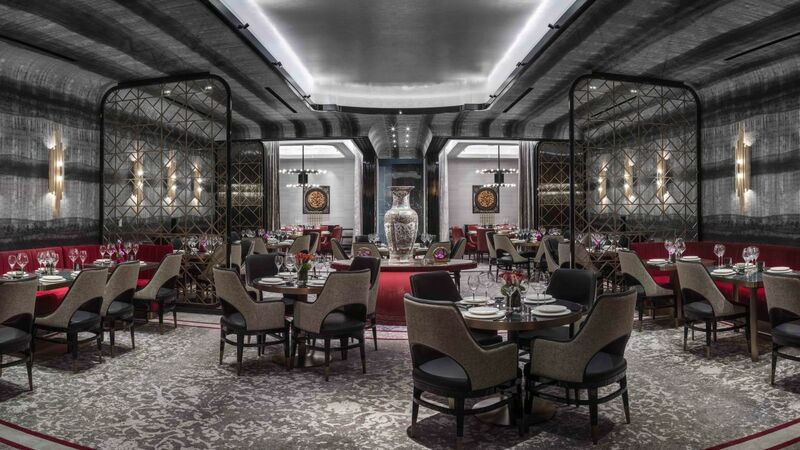 After much anticipation, The Cosmopolitan has taken the wraps off its first Chinese culinary concept, the latest in the ongoing makeover to the resort’s restaurant portfolio that includes the recently opened Block 16 Urban Food Hall. The creative team behind Red Plate spent two years traversing Asia, sampling hundreds of dishes from more than 35 Michelin-star restaurants in Hong Kong, Shanghai, Macau and Guangzhou to deliver a “truly bespoke, original” restaurant, according to Patrick Nichols, senior vice president of strategy and business development. To up the ante, designer Vincent Celano (Bagatelle, The Arden) has reimagined the space formerly occupied by DOCG on the hotel’s third floor. The final concept is a “celebration of traditional Chinese craft, artwork and furniture-making balanced with contemporary details and materials,” explains Celano. Chef Yip Cheung, who oversaw dining at the resort’s high-stakes Talon Club, heads the kitchen. Red Plate aims to please that same high-roller crowd with a menu of roasted meats, handmade dim sum and signature Cantonese dishes. “Guests will not find General Tso’s chicken at Red Plate,” adds Nichols.